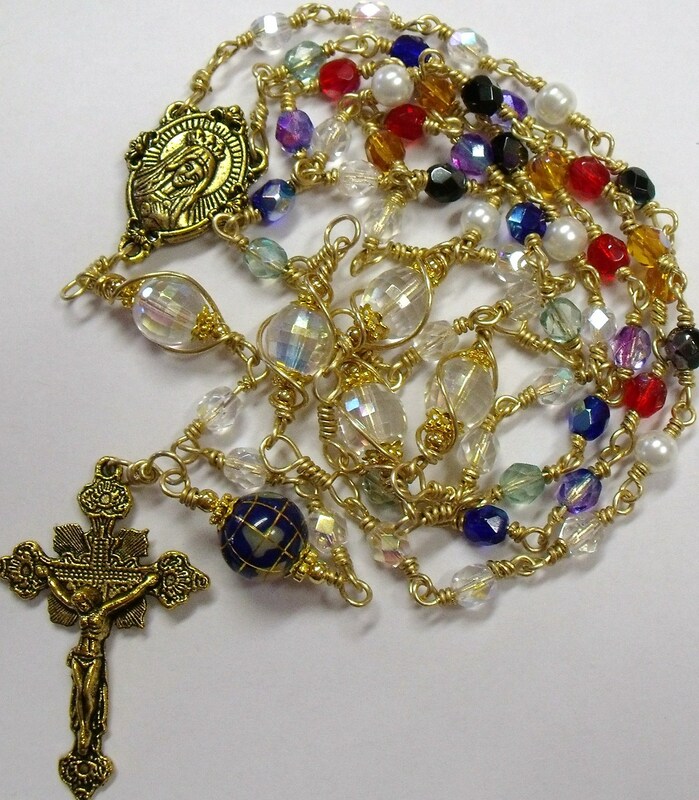 World Peace Rosary | Nan Tubre Writes . . . The world is in a big mess. The same statement was said ten years ago, fifty years ago, two hundred years ago, even two thousand years ago. It’s always been a huge mess. Don’t you wonder why? What is it that makes the human race go for the throat over land, possessions, and, especially, religion? We are, after all, charged to love one another, are we not? Isn’t that what God commanded? And since we profess to follow Him, wouldn’t it be just and right to love one another? Why, then, do we, as a whole, disobey Him? Simple. It’s called free will. He gave us the ultimate gift when He gave us free will. One would think that if God wanted us to love one another, He wouldn’t have done that. Wouldn’t life be so much easier if we didn’t have to decide who we love and who we don’t? But God doesn’t want living, breathing puppets. He doesn’t want the world to love Him simply because He is God. He wants us to love Him because it is OUR choice to do so. That is what paved the way for the biggest Gift of all, the one that keeps on giving, the Son of the Living God, Jesus. Because of our free will, we need Jesus. Because He became human like us, we find it easier to relate to, (ie; love) Him. God gives Himself over to us in ways we can understand. So why, then, is our beautiful world in such a mess? Why do we not exercise the freedom of choice in favor of love? Why is the human race so prone to war over worldly goods, sometimes even in the name of God? Good question. Who knows? I cannot possibly fathom the reasons why and only a fool would try to second guess the Creator. What a ridiculous concept! All I know is we need to pray for peace. We must pray for peace. We need to call upon God, Jesus, the Holy Spirit, the Virgin Mary, and all the angels and saints. You don’t have to pray a complicated prayer. I’m pretty sure “Lord, please send Your peace to all the world” will suffice. Pray with your heart and pray often. The world needs your prayers. Green – North America. Blue – South America. Purple – Europe. Amber – Australia. Red – Asia. Black – Africa. White – Antarctica. The rest is filled in with clear crystal beads with an aurora borealis finish. The first Pater bead is the world globe bead. Each bead is hand wrapped and strong. 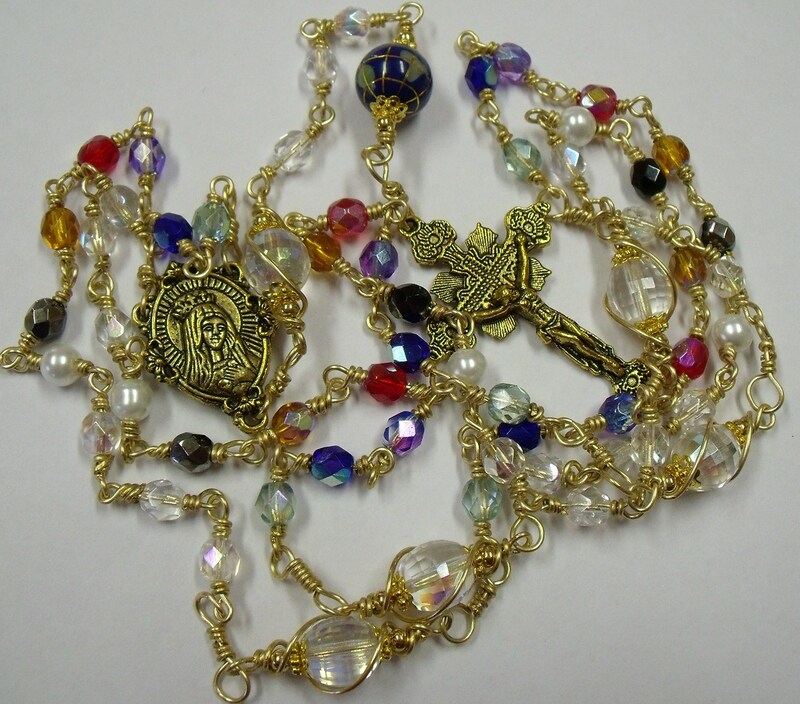 It’s not likely this rosary will ever break no matter how often it is used. The love we have for our fellow-man should be so strong, don’t you think? Let me know how you like it. I want to add one to my Etsy shop. « Have you ever seen a car wear a bracelet?